In the short term, one of the easiest things to do is make cake. This moist Blackcurrant Almond Cake is always a winner. I normally make it in a shallow 25cm loose-bottomed tin but, for a recent party, baked it in a rectangular 23 x 33cm Swiss roll tin. Cut into fingers, dusted with icing sugar and piled high on a cake stand, it was a delightfully light counterpoint to some of the richer deserts on offer. Some are stashed in the freezer for jam making, which will happen next month. 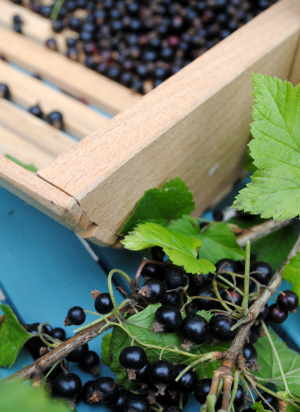 Loaded with pectin, blackcurrants are one of the easiest fruits to turn into jam. Just avoid that awful stuff called “jam sugar,” unless you really want your homemade conserve to rival the large-batch rubbery stuff that you find in supermarkets. Tart, softly set blackcurrant jam is superb on buttery breakfast toast, especially when a couple of spoonfuls of amaretto or cassis are stirred in to the pan just before you pot it. And then there’s cassis. Marie-Claire Digby of The Irish Times has been trying out a few recipes and featured my version in her Irish Times feature on making fruit liqueurs last Saturday. Margaret of Foodborn and Bred has a recipe for crème de groseille or redcurrant liqueur in the same article – I love the idea of Green Cowboy martinis, using some homemade gooseberry gin. 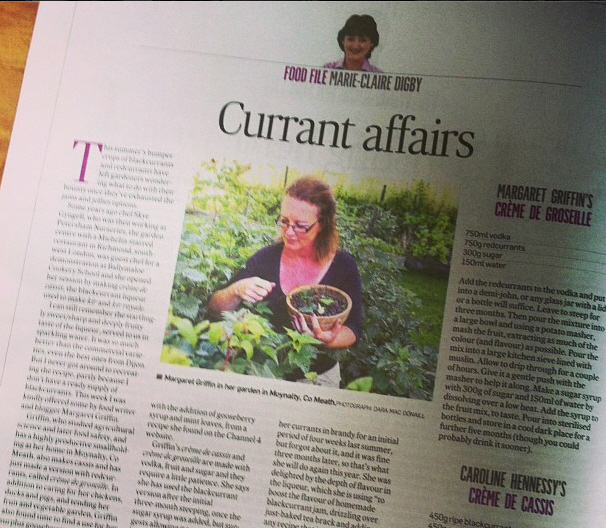 The Irish Times: Currant affairs – Food & Drink | Recipes, Reviews | Restaurants, Wine & Healthy Eating – Sat, Aug 10, 2013. Try this with sparkling wine, in homemade blackcurrant jam, drizzled it over just-baked tea brack or add it to any recipe that involves almonds. Put the blackcurrants into a bowl and mash thoroughly. Add the caster sugar and mash again. Scrape the purple mush into a large sterilised kilner jar, drop the leaves in and pour over the brandy. Stir well. Leave on a warm windowsill for a week, giving it an occasional stir, then fish out the blackcurrant leaves and put the jar in a cool dark location. Allow to macerate for another three months then strain out the fruit – boozy blackcurrants make a great tart or crumble when combined with cooking apples – and pour the resulting liquid into sterilised bottles. Allow to mature for at least another three months. Makes approximately 900mls of cassis. After reading the article in the Irish Times and publicly lamenting the demise of my currant crop after an attack by feathered friends, I got offered black currants by Margaret Griffin who was prompted by MC Digby. Having a surplus remaining after jam making, I decided to put them to good use and make the Crème de Cassis. So on Christmas morning 2013, my Kir Royale will have come courtesy of @foodborn @bibliocook and @mcdigby Merci beaucoup. De rien, Marie! Glad you got sorted for jam and cassis making. I’d really miss my annual supply of blackcurrant jam. Goes especially well with toasted Cinnamon Raisin Bread. As for the cassis…it’s disappearing far too quickly in this house at the moment!